unfortunately you didn't post the test script and test data for your test which makes it hard to comment on the results. Also you don't say how exactly you measure the memory usage. Is that the overall peak? The reason why there is no fetch_all with USE_RESULT is due to the way mysqlnd works: The data is directly buffered in a form which can be passed as zvals directly to PHP. So fetch_all is simply creating a PHP array over the buffer. For doing the same with STORE_RESULT the fetch_all implementation couldn't simply re-use the existing buffer but build one, which would, in the end be the same as doing implicit STORE_RESULT while you've chosen to to USE_RESULT explicitly. Maybe this will be changed but it feels a bit strange to override explicit decisions by the user. Big fan of the fetch_all() method myself. One thing to note, the behavior of what is returned for an empty record set has changed with PHP 5.3.3. Pre 5.3.3 NULL was returned, as of 5.3.3 an empty array() is returned. Well thats an interesting find. I am interested to see how does it compare on real world workloads as this can be something use-case specyfic so hard to say. does it perform better on small data sets (i mean fetching 100 rows not 30k) does it work better on concurrent requests (20-100 threads connecting to the db at the same time) etc. What is the point of avoiding buffering rows, if you are just buffering them all in your array anyway? Just use STORE_RESULT and be done with it. If you are using mysqlnd you'll convert the row buffer into an array directly. No duplication of memory, even with STORE_RESULT. Well Justin, that is a good question. I wanted to answer that question with this post, but I got blind sided by other issues with mysqlnd that made me abandon it altogether. 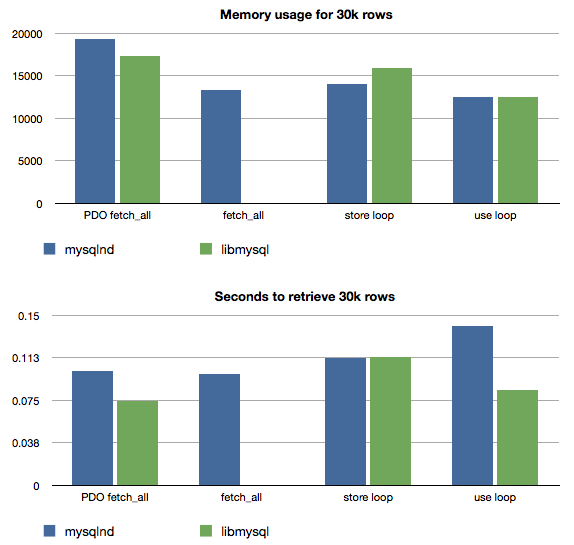 The memory usage was higher with mysqlnd with fetch_all in my tests, however, this could be simple overhead memory and not be affected by the data size. More tests would need to be done to determine that. Maybe I can find some time to do some more benchmarking with Phorum data which is much more real world.